Since the words seem stuck inside today and since I absolutely adore my dear friend Judy Clement Wall and her uplifting, inspiring, full of zest & whimsy art, I will leave you with this beauty. Such a whimsical, fun work of art! I love the message. 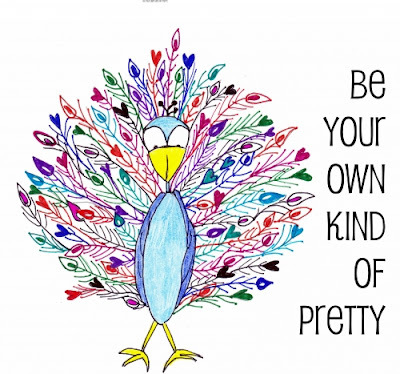 I'm thinking, be your own kind of pretty...and CREATE your own kind of pretty. Lots of food for thought. Yes, Deb---BE, SHARE, CREATE--all of it! What a relief it would be if we just all settled into ourselves and stopped hiding it all beneath layers of...so much. Sending love to you today, dear person. Me too, pretty-as-can-be, Rachel. Loving you, my color-filled friend. And you to me, J--you already know this but I'm going to keep telling you. This is so dear. What a precious word of encouragement for me today -- to embrace the pretty that is me, instead of comparing to the beautiful her. Thank you, Julia and Judy. xoxo! Ashley--I'm so inspired by & in love with the pretty that is you. You shine so brightly, my friend. This IS full of zest & whimsy. Adorable. I agree, Debra. Thank you for taking the time to connect! Some people get prettier the more you get to know them and others lose their prettiness because it's only skin deep. There is nothing prettier than a loving attitude. And you, my beautiful friend, have such a loving attitude...not just an attitude but an embodiment of pretty--of LOVE. I appreciate you so much, Leah.